Can you consume too much fiber? Higher consumption of dietary fiber has been associated with lower risk of death from all causes as well as cardio-vascular diseases such as heart attack and stroke. A recent analysis of most of the published population studies on fiber and cardio-vascular diseases was published in the British Medical Journal and here is a link to the original paper: Dietary fibre intake and risk of cardiovascular disease: systematic review and meta-analysis. BMJ 2014. 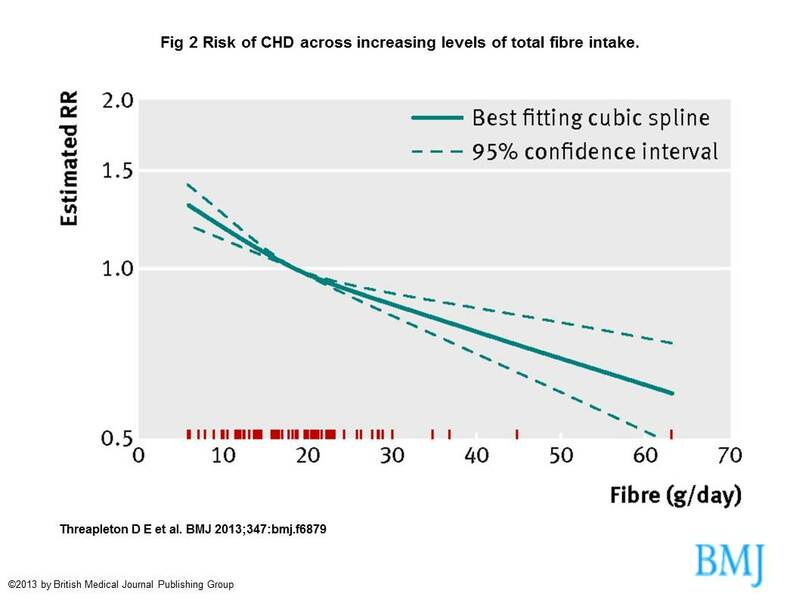 Figure 2 from the paper is shown below and illustrates relative risk (RR) of a heart attack (CHD) with varying degrees of fiber consumption from all sources. Note that less than 20 grams a day is associated with increased risk (10 gms a day corresponds to a RR of around 1.3 means a 30% increased risk of a heart attack or similar event). To put this into perspective a RR of 1.3 is of the same order found to be associated with raised LDL cholesterol and taking Statins reduces the risk of coronary heart disease by around 10 to 20% i.e. RR 1.1 to 1.2. It is interesting to note that food consumption studies reveal that the majority of UK and US people consume around 10 grams of fiber a day, much less than the recommended 30 grams a day. The study found a dose response relationship between fiber intake and cardio-vascular disease where each 7 gm increase decreased risk by about 9%. They projected a possible 40 to 50% reduction in risk with fiber intake of 60 to 70 grams per day. How can one consume 70 plus grams of fiber a day? A fascinating study by Jenkins et al 2002 sheds some light on these questions, and the original paper can be accessed here: The Garden of Eden: plant based diets and the genetic drive to conserve cholesterol and its implications for heart disease in the 21st century. It consisted of large amounts of leafy vegetables, nuts (almonds and hazelnuts), and fruit, some tropical, but all purchased in local grocery stores. Theoretically, all these foods could be eaten raw but the majority of vegetables were eaten cooked. The diet was effectively devoid of any significant amount of starch. The major feature of the Simian diet was the large volume and the length of time spent eating. Considerable pressure had to be brought to bear on the subjects to ensure they ate all their food and did not lose weight. The foods were palatable but the volume (5.5 kg/d for a 70-kg man) was excessive. At the end of the 2-week diet periods of weight maintenance, LDL-cholesterol was reduced on the Simian diet by 33%, on the Neolithic diet by 23% and on the therapeutic diet by 7%. Analysis of the diet for components, which might alter cholesterol metabolism, showed that the Simian diet provided approximately 1 g of plant sterols daily, 145 g of fiber and 92 g of vegetable protein and on an average, over 70 g almonds or hazelnuts per day. There was no downside for consuming a relatively massive amount of 145 grams of fiber per day. On the contrary fiber consumption was a powerful limiting factor regarding total calorie intake: Considerable pressure had to be brought to bear on the subjects to ensure they ate all their food and did not lose weight. For those wishing to control their weight there is a warning sign from the study in that whole grain cereals are regarded as the obvious source of fiber but they are also the major source of high glycemic starch in our diet and attempts at eating more whole grains to maximize fiber consumption runs the risk of weight gain with high blood sugar and insulin levels. For instance whole wheat contains 61% starch as well as 12% fiber and in order to get 48 gms of fiber from this source one would have to simultaneously consume 244 gms starch and 56 gms protein, an extra 1200 calories. In order to achieve adequate fiber without weight gain there is a need to replace whole wheat flour used in staples like bread, pasta, cakes and cookies with low carb/high fiber formulations (www.fiberflour.org).